We tend to think of hedges as plain green blocks, made up of plants such as Yew, Beech and Laurel, marking the boundaries of our beds and gardens and providing the backdrop to more interesting planting. It doesn’t have to be this way: flowering hedges can be decorative elements in their own right. As the traditional hedge planting season draws to a close, there’s still plenty of time to plant a flowering alternative. A hedge of Choisya ternata provides both backdrop and decoration: the glossy, aromatic, bright green foliage provides an excellent year-round background for a mixed border, and in late spring the whole plant is smothered in highly scented, star-shaped white flowers. 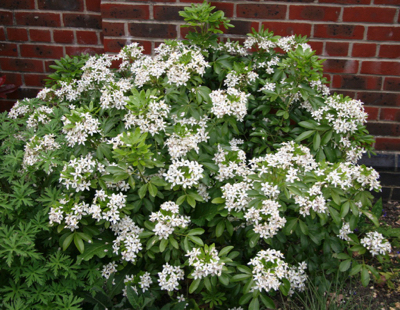 Other factors that make this evergreen shrub a popular choice for hedging include its fast rate of growth, dense habit and easy-going nature: Choisya ternata grows well on any reasonably well-drained soil in full sun or partial shade, reaching a maximum height and spread of around 2m by 2.5m. Its only special requirement is a relatively sheltered site as it won’t be happy in a very cold or windy spot. The cultivar Choisya ternata ‘Sundance’ has the same characteristics as its relative, but the young leaves are a glossy bright yellow in full sun or a more subtle yellow/green when grown in partial shade. I have to admit I’m not a fan of this variety as I think it looks a bit sick but it does brighten a gloomy area! 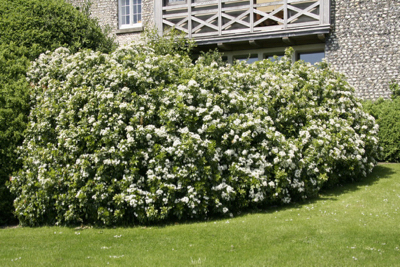 Garden care: established hedges should be pruned fairly hard immediately after flowering which may also encourage a second flush of flowering in autumn. Cut out frost damaged stems in early spring. Hydrangeas are great shrubs that flower all summer and autumn and make highly decorative informal hedges. 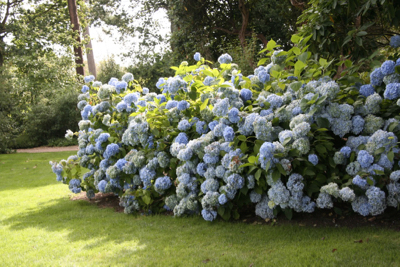 There a number of different varieties, but Hydrangea macrophylla cultivars make an excellent choice for hedging as they have large, long-lasting flowers and a compact, rounded habit and require only minimal pruning once a year. Although deciduous, the mopheads in particular retain year-round interest as the dried flower heads persist well through the winter. Which cultivar to choose will probably pose the biggest problem as the flowers come in two shapes – round ‘mopheads’ or flattened lacecaps – and a wide range of colours – whites, pinks, violets, blues and reds – while the stems and leaves can vary from green through red to near black. The final variant is size, cultivars varying from around one to two metres eventual height and spread. Once the choice is made, all the macrophylla Hydrangeas are fully hardy shrubs that require little shelter and thrive in windy gardens, including seaside ones, and perform well in full sun to part shade, but they do appreciate having their feet in cool moist conditions so prefer a deep, rich soil with plenty of organic matter dug in and a good spring mulch. Garden care: it is best to leave the flower heads over winter to give protection to the growth buds below. Dead head in spring after the danger of frosts, cutting back the stem to just above the first healthy buds. Hypericum x hidcoteense ‘Hidcote’ is one of a large genus, commonly known as St John’s Wort, that includes annuals, perennials, trees and shrubs which are all instantly recognisable for their prolific bright yellow, cup-shaped flowers. 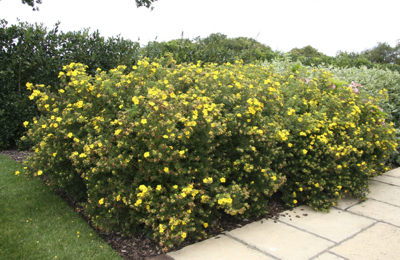 Of all the family, Hypericum ‘Hidcote’ is the most commonly used for hedging because of its dense, bushy, spreading habit, and its hardiness and versatility. This is a very hardy plant surviving temperatures down to -12 degrees centigrade, making it suitable for most areas although it will appreciate some protection from cold winds. 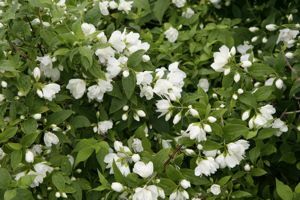 It grows well in most types of soil, preferably well-drained, and is happy in full sun or partial to full shade although flowering will be more prolific in a sunny spot. Appearances obviously matter too, and the dark green foliage makes a superb backdrop to the profusion of stunning golden yellow flowers with orange stamens which come in relentless succession from mid-summer until late autumn. Hypericum Hidcote is referred to as ‘semi-evergreen’ as the leaves can drop for a couple of months in the hardest of winters but regenerate in spring when the whole hedge will benefit from a trim to remove last year’s growth and maintain its bushy habit. 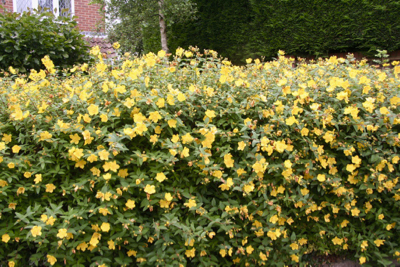 Eventual height is 1.5m, but Hypericum Hidcote hedges are best kept to a maximum of 1m high to prevent them getting straggly. Garden care: apply a good mulch of rich organic matter after pruning. The relatively recent move towards more naturalistic planting has led to a much wider use of ornamental grasses in planting designs and the introduction of the idea of using grasses as screens and hedges. Although maybe not the most obvious choice when thinking of hedging, grasses lend themselves very well to the job as they add both colour and movement and can be designed to be a textural through-line in a garden, lending themselves easily to straight lines or sweeping curves. 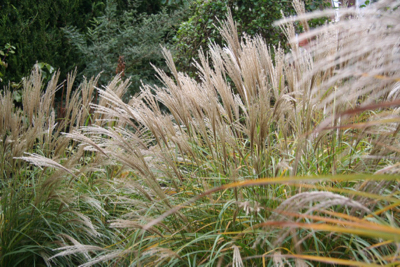 Of the many grasses available, it’s hard to beat the cultivars of Miscanthus sinensis for their long season of interest, colourful flowers and sturdy ability to remain standing through winter. Miscanthus ‘Yakushima Dwarf’ has fine textured, silvery-green leaves that form upright, arching clumps up to 1.2m high and in late summer long-lasting plume like panicles of pinky-brown, silky flowerheads emerge and delicately change to silvery white as they mature. The flowerheads and leaves glow with gold and orange when they catch the winter sun and are breathtakingly beautiful with a coating of hoar frost. It’s not a fussy creature, apart from disliking winter wet, and grows well in any fairly moist and well-drained soil, becoming drought tolerant once established. Maintenance couldn’t be much easier either: simply cut down once a year before new leaves start to grow and divide every few years. I like the fact that a hedge of grasses is a dynamic addition to the garden, and changes throughout the year rather than simply being a static object like a more traditional hedge. Shrubby Potentillas are the victims of considerable garden snobbery: mention their name to many gardeners and what comes to mind is a rather common, ‘old-fashioned’ little plant covered in brash yellow flowers. It’s one of those tough old plants, like Mahonias and Forsythias, that got their unfavourable image largely through being the uncared-for survivors of long neglected gardens and their unfortunate tendency to have unsubtle, unfashionable bright yellow flowers. But times have moved on and nowadays Potentilla fruticosa, the most commonly available species in the UK, comes in a whole range of colours, still including many yellows, but also numerous shades of white, pink, orange and red. It’s a good idea to choose your colour carefully as you’ll be seeing a lot of it – given a sunny spot, Potentilla fruticosa will produce masses of saucer shaped flowers, resembling those of single roses, from May until September and needs very little care or attention to do so. The dainty, deeply divided, deciduous leaves vary in colour from dark to grey/green and the shrub has a spreading habit that forms neat mounds roughly 1m high by 1.5m wide. 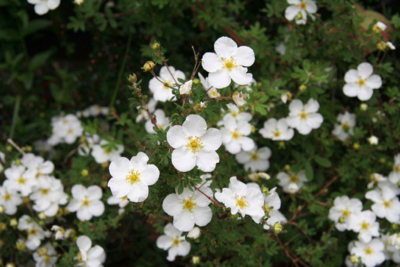 Potentilla fruticans ‘Primrose Beauty’ AGM is a particularly long-flowering variety with pale yellow flowers and grey/green foliage and Potentilla ‘Abbotswood’ AGM has large, pure white flowers and mid-green leaves. Potentilla fruticans is a tough, resilient, fully hardy shrub that needs no watering once established thrives in poor, well-drained soils and is pretty much impervious to pests, diseases and deer. All of this makes it an ideal choice for hedging, especially on a hot, dry site and it makes a very good companion for other drought tolerant plants, especially those with silver leaves. Garden care: trim lightly with shears after flowering. Did you know that in the 60’s, if a house had a pampas grass outside – it meant that they were ‘swingers!’ apparently! I have heard that Shirley but of course I have no idea if it’s true! Could make a good hedge though?! Sadly, those are hedged that we do not grow here.. We have flowering hedges too, but gardeners typically ruin them.